Bazan, the man behind such bands as Pedro the Lion and Headphones, has officially retired the PTL moniker with his latest release, even though the band has always been his sole project. 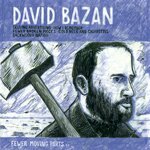 In typical Bazanian brashness, the song "Fewer Broken Pieces" addresses his new solo venture, saying that he had to fire some band members who weren't holding up their end. His new Fewer Moving Parts EP (which features artwork by Zak Sally from the band Low) has five songs, but includes two versions of each: a stripped-down acoustic version and a full-band version. The different sounds emcompass all of Bazan's work over the years, from his 4-track recording days, to his full-band mid-career sound, to the electronic splash of Headphones. Despite being only an EP this new album features some of Bazan's best work. It's been a while since he was so angry, seething, and gritty. Bazan saves much of his bile on the track below, which Bazan has said is about Ryan Schreiber of Pitchfork. While I was a little put off by this information, Bazan has a way of making the song more about himself, about his faith, and his desire to be accepted more than it is about Schreiber, again proving why Bazan is one of the best lyricists out there.